Fes is the largest preserved medina (walled city) in the world. It is over 4 square miles of car-free winding alleyways that are instead filled with donkeys and carts. When mom was in town earlier this month we took a day trip to check it out. It is a 2 hour drive from Rabat, through mountains and lush valleys (who knew?). Honestly, I think Fes is the Venice of Africa. Don't start thinking canals, but once you enter both cities you step back in time where many things are done as they were hundreds of years ago. Goods still come in by donkey or man-pulled carts (or boats in the case of Venice) and the buildings are continually restored to maintain their original architecture. Instead of the sounds of cars, trucks, and horns, in both cities you simply hear the daily rhythms of life. Women still walk to the markets every morning to buy their bread and produce, and craftsmen still work in cramped shops as they have for generations. 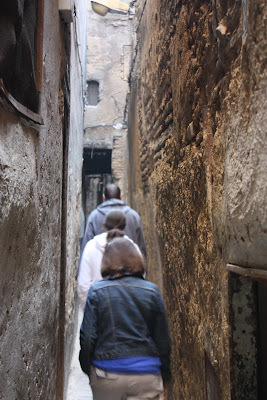 They are both made up of narrow streets and winding alleys, that if it weren't for our guides, I have no doubt we would still be wandering around lost inside. And for a really cheesy side-note here, can I just say that I find it a bit magical? Fes is a lot of walking with a lot of hills. It's not handicap accessible and it doesn't smell great. BUT it does have some of the most amazing handicrafts displayed around every corner with architecture that will take your breath away. Market stalls. This is one of those situations where if you don't want to see the beheading of a chicken, you need to keep your eyes straight ahead. Men working in the "Dyers' souk"
A rare peek inside a Moroccan mosque. This one is apart of the world's oldest continuously running university. 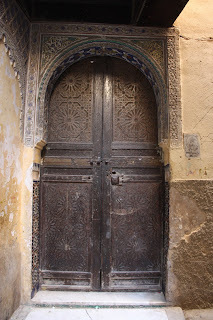 Fes is known for its leather. This is a tannery just inside the medina walls. The workers spend all day in vats of dye working with the hides. Not a great aroma. We went into a co-op and watched some old-school weaving. Bought some scarves they had made. Another gate. These folks sure know how to make an entrance. Thanks, Fes! It's been real. P.S. Fes is a pretty cheap flight away from many European cities. 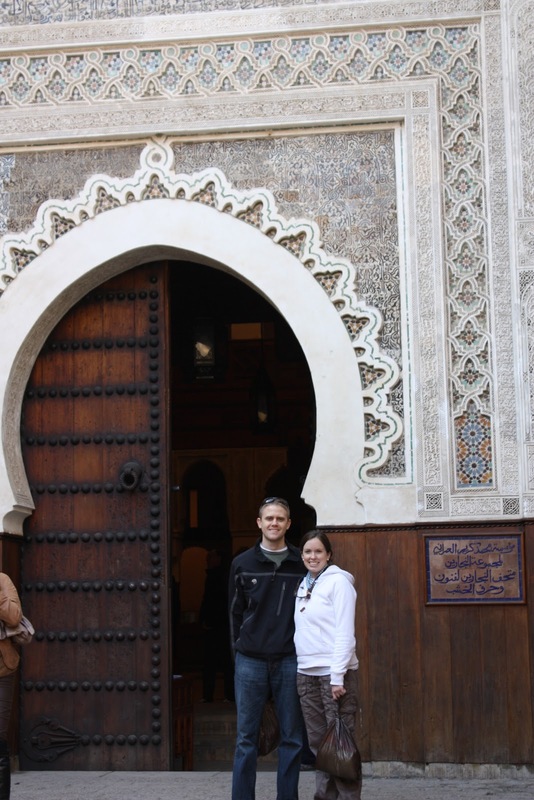 It would be a great glimpse into the Arab world at the beginning or end of any vacation.